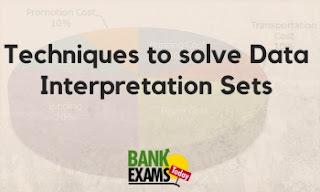 Why Data Interpretation Section in Banking Exams? 1. With D.I section, one can test the aspirant ability to solve statistical data. 2. In Banking Industry, there is demand of those who are highly proficient in calculation. This is because bank employees need to work on statistical data on daily basis. 3. D.I section also tests one’s ability that how quickly one can analyze the graph and extract the relevant data from it. There are so many topics which can cover under D.I set, like Percentage problems, Profit & Loss, Average, Age problems, Work & Time and many more…..
At the very first, you need to know all the basic concepts of mathematics and also learn basic formulas as well like percentage, average and so on. In Data Interpretation set, one graph is given and you need to solve some questions from the given graph. There are some variables also given and they represent some value which you need to identify. You need to see the graph carefully and should try to focus on key variables. In every D.I set, there are one or two questions are very simple whose answer could be obtained just by seeing the graph. So, you need to solve those questions first without wasting time on complicated questions. Now, after solving easy questions you can try other which could be solve by simple formulas. Please skip those questions which take heavy calculation and more time. (Q No 1-5) Study the following pie-chart carefully to answer these questions. Q1. What is the respective ratio between number of players in hockey and number of players in Basket Ball? Q2. Number of players in Cricket is approximately what percentage of number of players in Football. Q3. What is the difference between number of players in Cricket and number of players in Hockey? Q4. What is the average number of players in Football , Cricket and Basketball ? Try the above question after reading the article and surely it will help you to choose which question you have to do first. Note: In short, all that you required to solve D.I set is to read the graph carefully and understand the data. Graphs could be given in many forms, either it is in Line or in Pie-Chart or in any other form also.